I recently took a public speaking class and one of the other students did a speech on self compassion. She talked about how we attack and hurt ourselves in ways that we would never do to friends, families, and strangers. While I think she underestimated my willingness to be rude to others, she is right in that I am even meaner to myself. I am constantly and even obsessively self-critical: questioning every decision, agonizing over looking and sounding stupid to others, and beating myself up over my weight and appearance. It is very difficult for me to be kind to myself and that makes it hard for me to be kind to others. 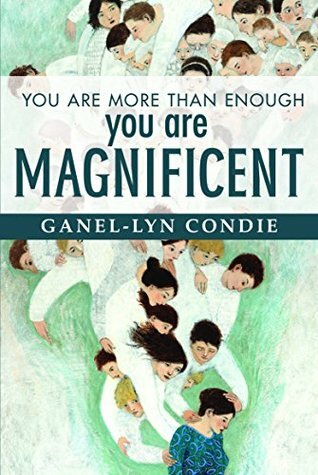 In this book, the author reminds women that they are not the failures and miscreants they think they are. In fact, she makes a good case for loving yourself in your imperfections while continuing to strive to be more. It can be difficult to reconcile the two. It's hard to find the balance between self compassion and complacency - to keep working to improve while being patient and even proud of where we are right now. My instinct is to argue back and say, "I'm not enough, and I'm definitely not magnificent," but that's the point of the book, isn't it? Many, if not most, people find it hard to forgive themselves for even minor mistakes and struggle with a distorted self-image. I have family members who are narcissistic and incapable of seeing faults in themselves but masterful at seeing faults in others. I have spent decades trying to recover from toxic relationships with these people - being told daily all of the ways I failed to measure up. So many years of being told that I was worthless took its toll and I still struggle to see myself clearly. It's like spiritual and emotional anorexia. I see myself one way and others, presumably, see me another. I need a better mirror. The message of this book was exactly the balm my spirit needed, especially at this time when I'm going back to college. I loved the stories she shared of women who refused to recognize their own value while others could see it so clearly. I especially appreciated the story of the plaster Buddha statue. In 1955 people were trying to move a 600 year old plaster statue of Buddha. A rope broke and the statue crashed to the ground, cracking it. On examination they discovered gold hidden within the plaster. The statue was solid gold and its true value would never have been discovered if it hadn't been dropped. The analogies to our lives of adversity exposing our true selves was apt and something I will remember long after I've forgotten other messages from this book. You can read more about it here. I found this book to be encouraging and inspirational and I recommend it. Five stars.